With herring meal, salmon meal and whitefish meal as the protein sources, your dog is ensured high protein levels that help develop and sustain energy and lean muscle mass. Along with protein, there is a healthy mix of natural fibers from vegetables and fruits like peas, apples, blueberries, carrots, spinach and cranberries, which contain natural antioxidants important for the immune system and everyday optimal health. Formulated without grain or gluten, this special formula is ideal as a high-protein, grain-free alternative diet. L-Carnitine helps convert fat into energy promoting lean muscle mass and healthy body condition. A proper ratio of Omega-6 and Omega-3 fatty acids helps support a lipid balance for healthy skin and coat. 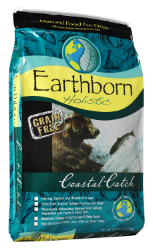 Made with our high-quality ingredients and processing technology, Coastal Catch™ provides excellent digestibility and nutrient absorption. 3725 (M.E. Calculated, as fed) kilo-calories per kg/435 (M.E. Calculated, as fed) kilo-calories per cup.